Lynn Coady can take a concept that I would be tempted to base an entire story around and toss it off as a throw-away line uttered by one of her characters. I guess that's why she is Lynn Coady and I am not. She does this several times in her Giller Prize winning collection of short stories, Hellgoing, and I am jealous each and every time. The characters in Hellgoing have an unfailing way of getting under your skin. They are not always the nicest people, but neither are they a super-villain variety of evil. 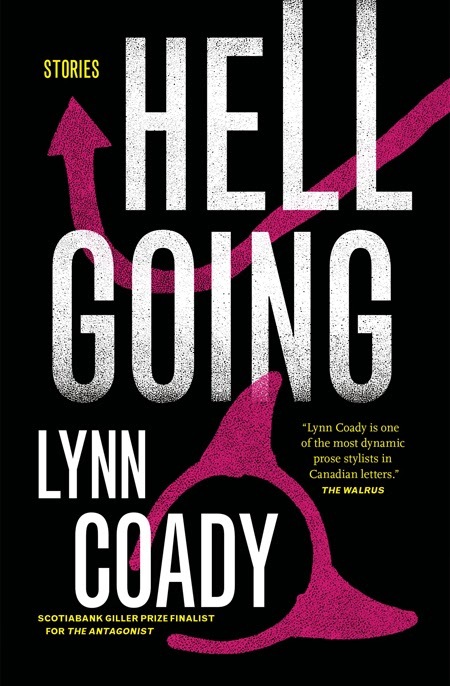 Rather, the characters in Lynn Coady's stories are oddly flawed, often in a disturbingly public and unapologetic way. Hellgoing has no shortage of people who flaunt, either through choice or situation, their slightly shocking foibles. There is the writer who carefully follows her own code of conduct for being an alcoholic, to the extent of coaching a hook-up on drunkard etiquette. There is the woman who uses her uncomfortable visit with her estranged family as fodder for supremacy during girls' night out. There are, among others, the reluctant landlord struggling with discomfort over his tenant's plight, the teacher and pupil whose strange relationship continues over the years, and the masochistic bride whose quest for pain spills out of the basement dungeon into daily life. The stories in Hellgoing do not necessarily wrap up tidily by the end, but then neither does life. The stories in Hellgoing may not end neatly, but they are gloriously complete. And they will haunt you. I'd only read one collection of Coady's before (Play the Monster Blind), but enjoyed it so much I was tempted to call her the best thing to happen to Canadian lit in a long while. But I need to read more, like this one, to further my case. Of course, I'll have to read everyone else's writing, too, so in 2067 I'll be ready to report back as to whether or not she was the best think to happen to Canadian lit in the early century. OK, It's on my list. Play the Monster Blind was the first Coady book that I read too, John. She has not lost her touch since then, and I can't wait to read her 2067 stuff. That's an excellent place for it, Eugene!